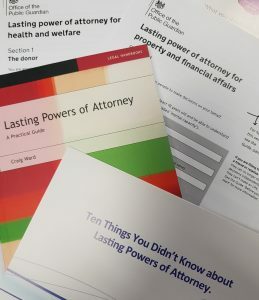 A Lasting Power of Attorney is one of the cornerstones of later life planning alongside a Will. Lasting Powers of Attorney come into force if you lack the capacity to make decisions for yourself during your lifetime. The most common causes of lack of capacity are a Stroke or Dementia. Lasting Powers of Attorney fall into two distinct categories Personal Welfare and Personal Finances, but both allow you to appoint one or more people to deal with your affairs whilst you are unable to. Personal Welfare – Your attorneys can decide what care you need, who it is delivered by and where. Ultimately they may be called on to make decisions on Life sustaining treatment. Personal Finance – Your attorneys can pay your bills, make investment decisions and manage your property. Appoints someone, or a number of people to look after your affairs if you can’t. Deals with Personal Finances and / or Personal Welfare. Avoids influence and interference from The Courts and Local Authorities, meaning your needs are taken care of by those who know you best. If you need advice, help to put Lasting Powers of Attorney in place, help with registration or help with dealing with the court of protection contact us today and we will be able to help. Miss Davies talks about her parents experience of making Lasting Powers of Attorney with Will & Probate Services. We offer FREE initial consultations, so if you need advice on Lasting Powers of Attorney, call us now on 01778 752861 or email: advice@will-probate.co.uk. It’s Never Too Late – We Can Help. If your loved one has lost capacity you may think that all is lost. But it is never too late and Will and Probate Services can help you apply to the Court of Protection for a Deputyship Order. This can be a daunting and complex task, but we have years of experience of dealing with Deputies, Courts and Applications so if you need help you should call us today.